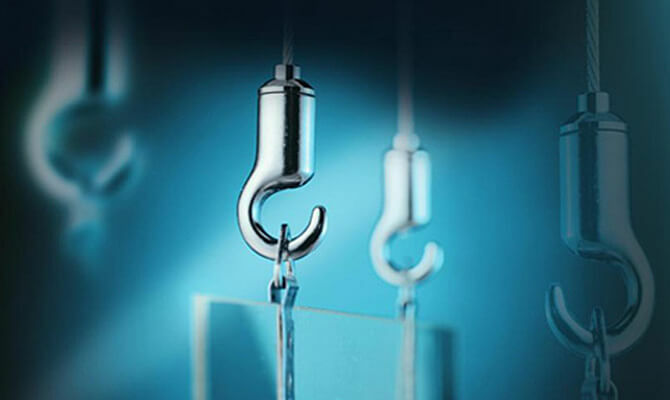 Posilock is a versatile cable suspension system that meets modern demands for transparency, flexibility and quality in the fields of interior design, retail display, lighting and visual communications. The product range utilises the M8 thread size. There is a reduced range of M10 thread size fittings also available. 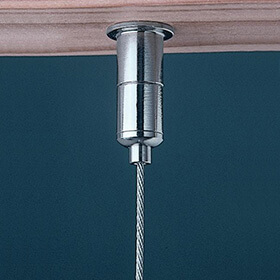 In the example above, glass shelves are held by the shelf holder (Y0721) which is fitted to the cable tensioner (Y0200). 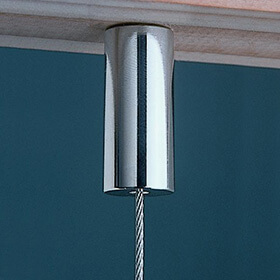 The cable tensioner can easily be moved up and down the cable to set the shelves at the desired height. An imaginative use here of the the elbow holder (Y0660), the comfort tensioner (Y0202) and the cable tensioner (Y0200) mean that in this example the cable is held parallel to the surface it has been attached to. The cover disc (Y0320) ensures that the untidy join between the elbow holder and the surface is hidden from view. 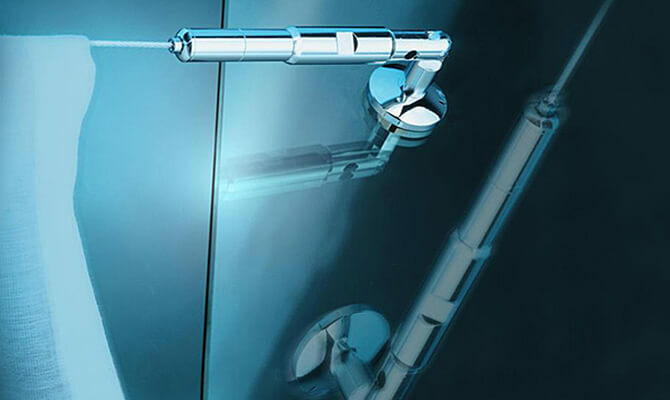 The Posilock adjustable hook above (Y0605) is frequently used in Posilock applications. 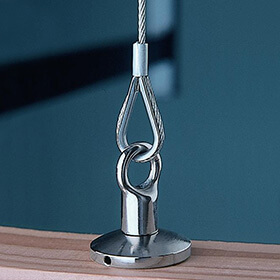 With its built-in tensioner the hook is popular in display applications when hanging pictures. 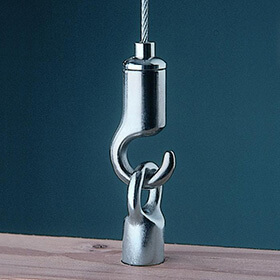 Cylinder anchor (Y0305) - this is fixed to a threaded screw and is used to hold a cable in place. 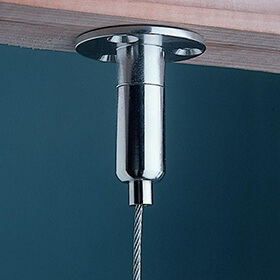 Adjustable hook (Y0305) connecting to eye (Y0610) - the eye is fixed to a threaded screw and the hook grips the cable. 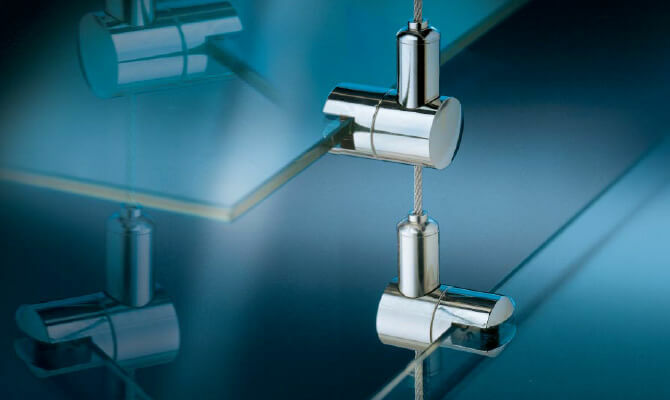 Mounting plate (YB950) with adjustable cable tensioner (YB900) - the M10 version of the mounting plate can be fixed to the ceiling (or floor) using the 3 holes in the main plate, whilst the tensioner merely connects to the mounting plate. Thimble (Y0072) and crimp (Y0080) connecting to the eye (Y0610) with cover disc (Y0320) - the thimble and crimp can be easily fitted using using a crimping tool to form a simple termination to the cable. Threaded anchor (Y720S) with small cable tensioner (Y0203) - this is a smaller version but with the same net result as that shown in the picture showing the mounting plate (YB950) with adjustable cable tensioner (YB900) above. 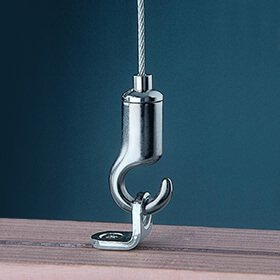 Adjustable hook (Y0605) connecting to small angle bracket (Y0401) - an alternative approach to that which is achieved in the picture showing the adjustable hook (Y0305) connecting to eye (Y0610).